Just send us an email (maximilla02@msn.com) with your wish list and zip code (or full shipping address). We'll package and weigh your order, calculate the cost and email you back with an itemized receipt. Voilà! $30 minimum (cost before shipping) for domestic orders. Orders over $50 get a free surprise from Whimsy! All proceeds go toward upkeep of the Menagerie. Thank you for your consideration and support! We use these pellets as the base of our chinnies' diets. This is a great feed that keeps good weight on the chins, without all of the "junk food" treats often found in pet store chinchilla feed. With nearly 100 chins to care for, our pellet supply is always ultra fresh. Extruded, extra hard kibble designed especially for gnawing animals dental health! This high quality feed contains chelated minerals and probiotics. We have been using this alongside our regular "soft" pellets to encourage strong, healthy teeth AND for palatability. It's slightly higher in protein and lower in fiber than our other feed, so it's not advised to use this in place of regular pellets. Used in conjunction with another high quality feed makes for an amazing combo. Now available by popular demand! Our recommended 50-50 mix of Purina and Blue Seal pellets combined in one bag. The premixed bag is good for one or two chins who might not eat through two full gallons very quickly. Buying in smaller quantities maximizes the benefit of nutrients provided by uber fresh pellets. A different kind of chewing and gnawing alternative. Ideal for people with hay fever, allergies, or who want to give their chins variety. Unlike many store-bought "treats," these healthy snacks are good for your critters! All natural rose hips add critical vitamin C to your chinchilla's diet, which helps strengthen the connective tissue in the gums to keep teeth healthy. 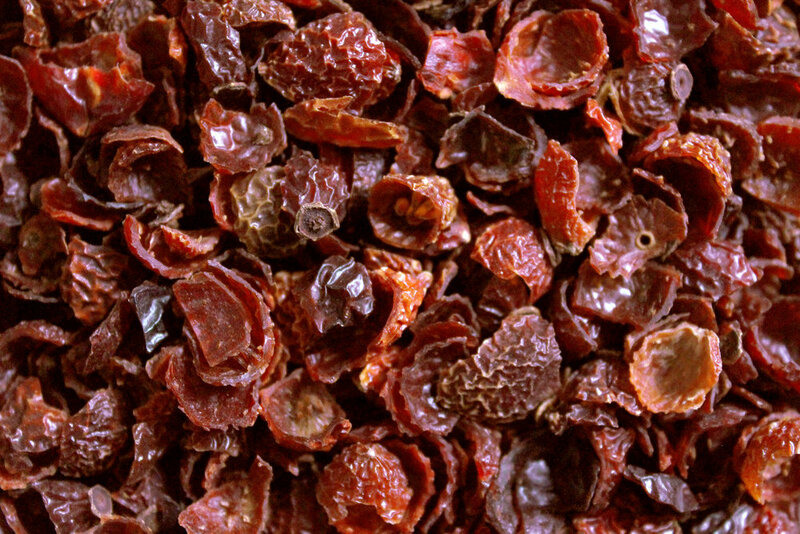 Rosehips are very gentle on the chin's digestive system and exceptionally healthful. We actually feed these by the handful. Rose hips (Rosa family) are native to Southern Chile andso more likely be found in the wild chinchillas diet. Win! Items priced per pound are not sold in smaller quantities. If your pet doesn't enjoy whole, or simply has an aversion to the itchy hairs surrounding the inedible seeds, cut and sifted rosehips are an excellent way to encourage them to get their vitamin C. You can offer it as a treat, or sprinkle on their hay. Finally! A foraging mix that you can offer in a separate food dish by the handful. "Confetti Cuisine" is a high-fiber, apple-infused potpourri of loofah bites, chopped hays, rose buds and petals, calming chamomile flowers, rose hips, lavender, peppermint, dehydrated carrot, and the ever popular crispy, dried leaves. Sold in giant 16" x 16" "pillow packs". A healthful and colorful blend of oats, barley, wheat bran, crushed rose hips, parsley, flax, bee pollen and more. Best for chins who are growing, pregnant, nursing or recovering from illness. Wonderful as a treat alternative as a reward for handling! Recommended rate: Start with 1/2 teaspoon per chin. Advance to 1 teaspoon per chin per day ONLY IF they show no signs of loose stool. Do not combine supplements or give multiple supplements! Despite their resemblance to raisins, these dry berries provide a much healthier alternative treat. These nutritionally dense berries contain 18 Amino acids (six times that of bee pollen), and 21 trace minerals. Goji berries also contain Vitamin B1, B2, B6, and Vitamin E (rarely found in fruits). They contain more Vitamin C by weight than oranges! This is extremely important for the prevention of malocclusion. The tough, leathery berry also contains many complex compounds and phytonutrients, extremely high levels of antioxidants, is very low in natural sugars. As with many treats, use sparingly. Recommended no more than 1 berry 2-3 times per week. Excellent for use as a reward for handling. Is your pet a fan of shreddable type chews? You may want to stock up on whole or sliced loofah to offer by itself or to reload your own toys. 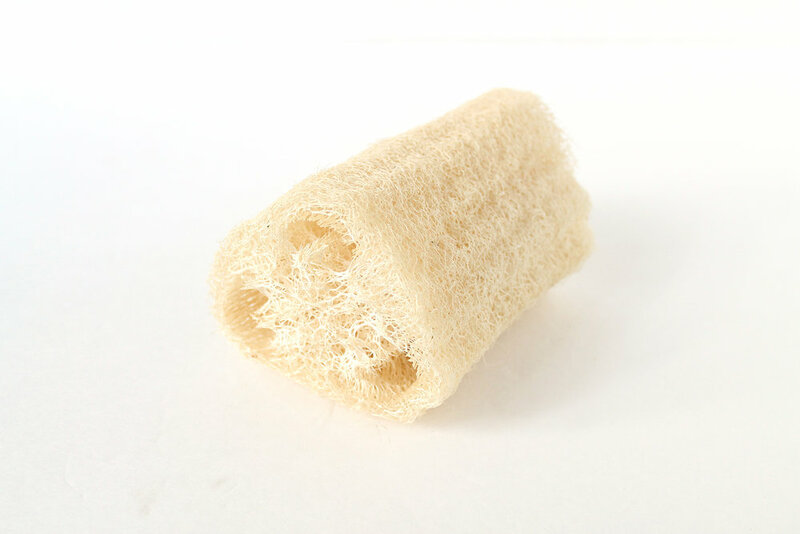 Loofah is an amazing source of fiber which aids digestion, gives your high-energy chin a chewing challenge, and promotes healthy teeth. We toss in a whole loofah each week. When the chins chew it down to the tougher heart, you can then wedge it between the cage bars and the silly critters think they have a new toy. Whimsy's own recipe, helps make owning chinnies bearable for those with respiratory issues or who are otherwise sensitive to regular, store-bought dust. Made with a special blend of minerals and clays. Use in place of commercial brands. Do NOT mix this with your store bought dust. It will NOT act as medicine to neutralize the other dust! Another Whimsy Original mix. Contains just the right blend of diatomaceous earth, sulfur and other antifungal ingredients. Tried and true this is a highly effective treatment for ringworm. Also makes an excellent occasional bath for ringworm prevention. For maximum effectiveness, use straight: do not mix with regular dust! Allow your chinnie 24 hour access to his/her duster for approximately 2-4 weeks. Not intended for permanent use. May cause temporary dandruff. Can be irritating to people prone to skin sensitivities. Normally used as a stall and cage freshener to absorb moisture and ammonia for odor control. It can also be used as a dusting alternative for especially high humidity days. (Although it does make your chins feel gross when you hold them). Proven to absorb toxins that are created by molds and microscopic parasites! This makes an excellent "base" for cage dusting underneath bedding. Also used as an additive in animal feeds, so is harmless to ingest. Too many things to choose from, and you can't decide? Maybe try one of our combo packs. Each package deal has been specially chosen to provide maximum benefit for your chinchilla while keeping shipping costs low, with the freebie built in. Please note that exchanging or adding extra items to these combo packs may incur an extra shipping charge. Just the basics to cover some of your chinchilla's most pressing needs. This package fits in a medium flat rate box. Offers a little more than the basics, with some larger portions than in the economy bundle and extra goodies.